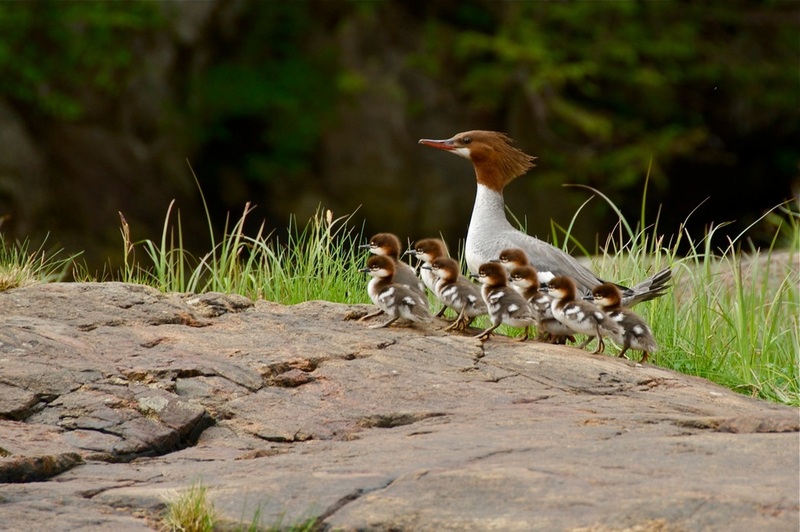 Top: adult female common merganser with chicks, photo by Chris Darimont. 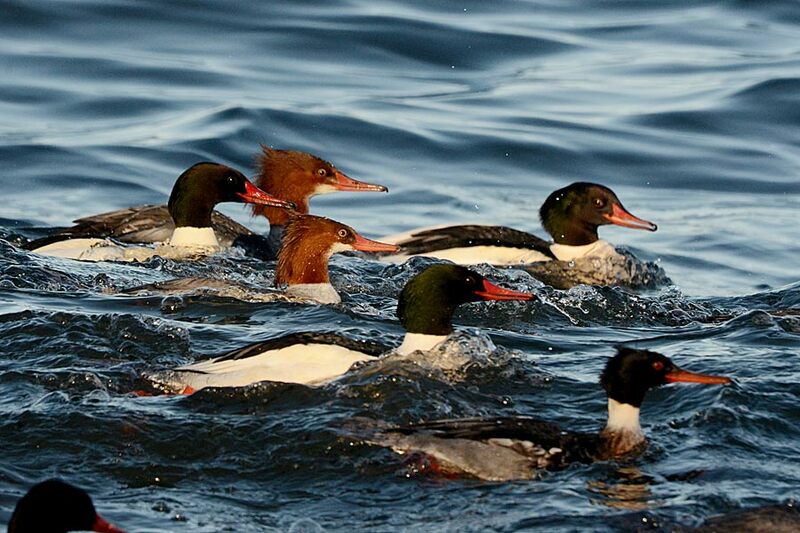 Bottom left to right: adult male, adult female, and males and females together (bottom right bird is a male red-breasted merganser). Photos by Mike Yip. 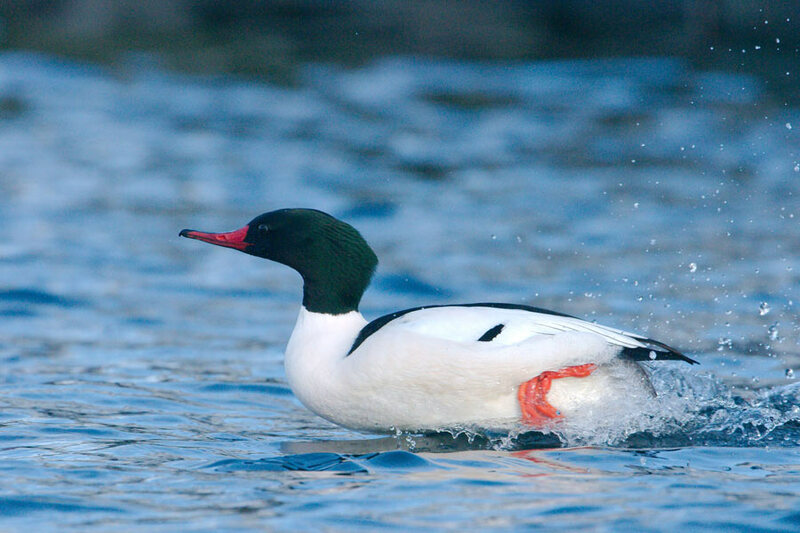 The common merganser is a large diving duck, with distinctive plumage but substantial differences between males and females. Both have a long and thin orange-red, hooked bill and wing white patches that are visible in flight and sometimes when folded. Males have a dark green-black iridescent head, white breast and sides, and a black back. Females have chestnut heads with a crest running down to the base of the head. This crest varies in size but is usually quite visible. Females have a white chins and breast, and a grey back and wings. Juveniles and nonbreeding males have the same colouring as females. 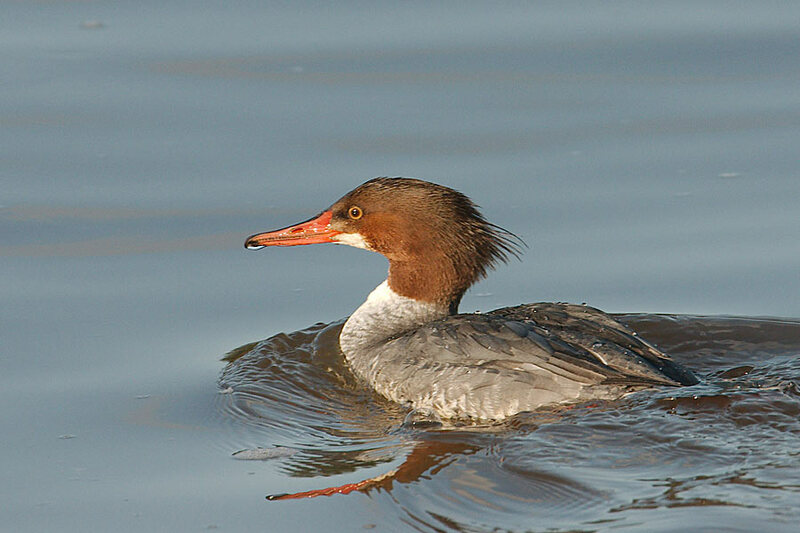 The common merganser is found in most areas of North America. Its winter range is in the United States, while itssummer distribution stretches across most of Canada except for the far north. The Central Coast and northwestern United States are home to year-round populations. The common merganser is usually found in freshwater lakes and rivers, but also spend times in estuaries and coastal bays. Two other merganser species, the red-breasted (Mergus serrator) and the hooded merganser (Lophodytes cucullatus), may be found in the Central Coast region. The breeding plumage of these birds is very different from the common merganser: the red-breasted merganser has a dark head like the common, but it has a crest that the common merganser lacks, and the hooded mergansers are black and white with a large crest. Females and juveniles of these species are more similar: all have crests and brownish heads, though the common merganser's head is more orangey-chestnut than the other species. Both are less common on the Central Coast than the common merganser. 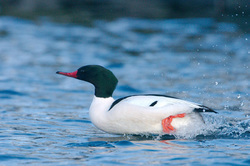 Common mergansers dive for fish; seagulls and bald eagles sometimes try to steal fish from them when they resurface. Dunn, J. L. and Alderfer, J. (Eds.). (2006). National Geographic Field Guide to the Birds of North America. (5th Ed.). Washington, D.C.: National Geographic Society. Pp. 48-49. Common Merganser Mergus merganser. The Birds of North America Online (A. Poole, Ed.). Ithaca: Cornell Lab of Ornithology. Retrieved from the Birds of North America Online. Accessed 23/10/2015.